After last weeks competition we decided we couldn’t let Spigen sit back on their laurels and stay in first place forever. Coming in to Round 2 we have our reigning champion, the Spigen Nexus 5X Tempered Glass Screen Protector (SGP11815). The challengers are from Bowhead and Pleson. Both were promising and both put up a good fight! There were punches thrown, shots fired, not to mention the crazy battery of tests we put them through. As a refresher – the Spigen Screen Protector beat out the competition for several reasons. First and most importantly, it didn’t break when I was peeling the adhesive backing off. Next, it was highly fingerprint and scratch resistant. Now, keep reading to see how the new guys held up in the competition! The Bowhead Nexus 5x Tempered Glass Screen Protector came in a sturdy cardboard package that contained everything I needed. The screen protector was in a foam sleeve, there were both wet and dry cloths, a dust remover sticker, and then my new favorite screen protector accessory, the guide stickers. The directions on how to apply the screen protector were clearly printed on the back of the package. Unlike most screen protectors I’ve reviewed, these were written well and didn’t require several rereads to get it to make sense. The wet cloth had the right amount of moisture and left almost nothing behind. The dry cloth quickly absorbed the moisture that was there and did so without a single streak. Between the two of them the screen was so clean that there was no need for me to use the dust remover sticker. I always struggle when applying screen protectors because it seems like I can never get them aligned on the first try. The guide stickers are a huge perk because you use them to line up the screen before removing the adhesive back. Since you’ve already done the dirty work with the guide stickers it goes on perfectly on the first try. I lined everything up, removed the back and applied the protector. It went on perfectly. The best part? Not a single bubble to be found! Next, I ran the screen protector through my normal barrage of tests. Drop tests on granite and wooden surfaces, no issue. I scratched the surface with my keys repeatedly, no issue. Left it in my pocket with my keys, ran some errands, came back home, no scratches or anything. I used the phone for a good 20 minutes or so and barely had a smudge on the screen. I then handed it to my two year old daughter. If anyone could get it to smudge, it would be her! She was successful but when I took the phone back the screen wiped clean with a simple wipe on my sleeve. Next up was the PLESON screen protector. I have a few other PLESON products that I have enjoyed and have been impressed with. This one had an almost instant turn off. Rather than having a picture of the Nexus 5X on the cover it had a picture of an iPhone. I’m not an Apple fan but that wasn’t my gripe with this. There are a lot of people out there who don’t always read the directions or descriptions on something before they decide to give it a try. There’s no sign anywhere on the package that it is for the Nexus 5X. If I were to see this several of these in a store I would have no idea what the actual contents of the package would be, my assumption would have to be that it was for the iPhone in the picture. 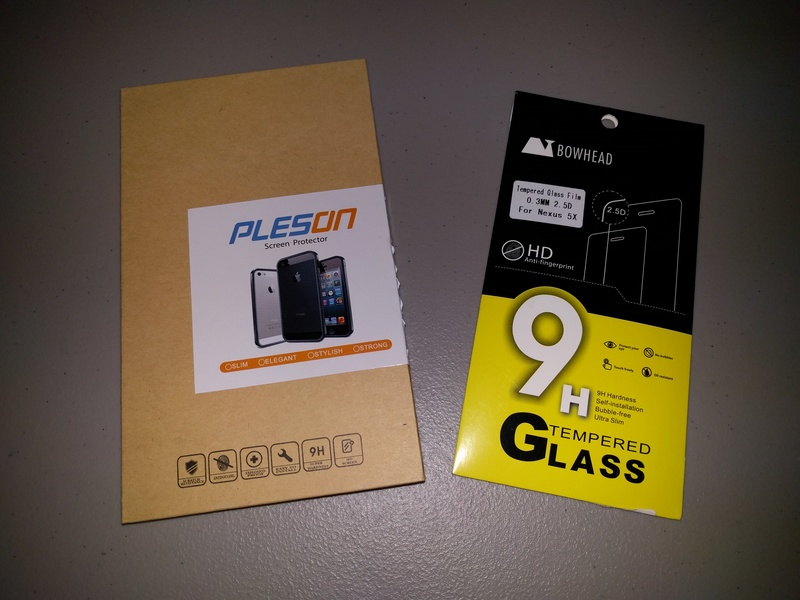 The Pleson Nexus 5X Tempered Glass Screen Protector came in a cardboard box with a foam lining that kept it nicely protected (much like the Yoozon Screen Protector from Round 1). Inside that box was a cardboard sleeve that contained everything I needed. The screen protector was in a foam sleeve, there were both wet and dry cloths, an instructions card and a dust remover sticker. The wet and dry cloths performed exactly as hoped. No residue, no moisture and a streak free screen. It was ready for the protector! Once the screen was clean I peeled the protective backing off, lined it up and applied it to the phone. It went on pretty easily and only had a few small bubbles around the edges of the screen protector. With a little pressure these went away and we were good to go. I then ran the screen protector through my normal round of endurance tests. I drop tested it from about a foot in the air on a granite counter top and my hardwood floor. I then took a pair of keys to it and scratched the surface with varying amounts of pressure. I then put it in my pocket with the same keys and a few odds and ends and left it in there for a good twenty minutes while I went about my normal activities. After all of that I looked the screen protector over and found not a single scratch! For my fingerprint test I always have a reliable partner that I can count on to create fingerprints on anything (my windows, TV and computer screen all will attest to her abilities!). My partner is my two-year old daughter. She and I went to town playing games, texting her mommy, pretending to call her friend and so on. Afterwards there were a few smudges and fingerprints but nothing that didn’t come off with a quick wipe down. Summary – We Have a Winner (sort of…)! This match was a lot harder to decide on a winner. Our previous winner Spigen won due to the awesome quality it had. The runner-up Maxboost didn’t win because it smudged a bit easier than the Spigen. This time all three screen protectors performed almost identically! In the end I decided to call it a tie. The Spigen screen protector still has everything I love and is the one I went back to but the Bowhead held up just as well as the Spigen and came with the guide stickers. The only reason it wasn’t a three-way tie was due to the packaging/labeling of the PLESON.